Four-color process printed on both sides of 14pt C2S Semi-Gloss stock. Coated with Aqueous Matte. 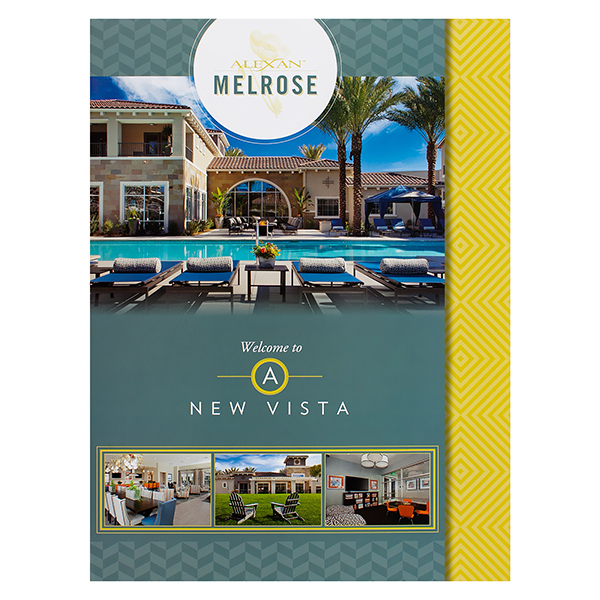 A cropped teal cover and yellow accents blend Alexan Melrose's brand colors with playful geometric patterns. Photos showcase the living quarters and outdoor spaces at the California apartment complex. Interior images play with various light sources to create the bright, sunny style indicative of southern California. Text on the back panel is paired with illustrated yellow wildflowers, contrasting the black bar at the bottom to make the leasing invitation extra prominent. Four-color process printed on both sides of 12pt C2S Semi-Gloss stock. Coated with Aqueous Gloss. V4 business card slits on right pocket. 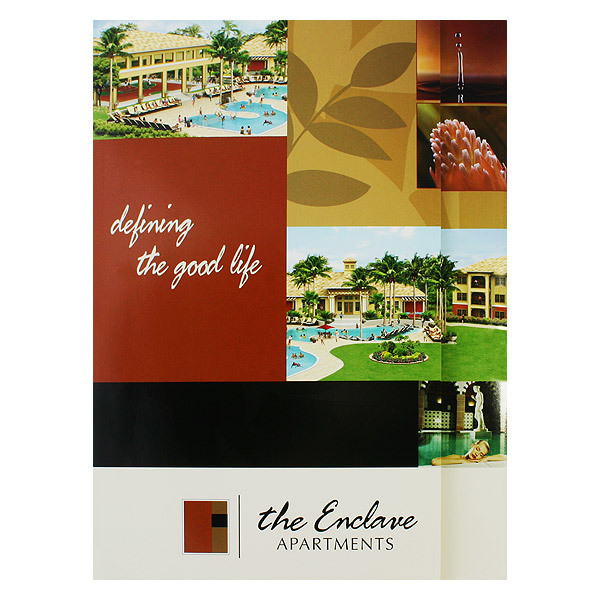 The Enclave Apartments' cover design mixes photographs of sweeping property vistas with vector illustrations to capture the lush grass and stylish apartments of the Florida living community. Bold blocks of color contrast the bright photos with warm, earthy tones reminiscent of home and family, while golden tones throughout the design convey a sense of luxury. The images overlap the exterior of the inner right pocket, thanks to the cropped front cover. Decorated in full-color photography, the vertical pocket presents renters' documents in style. Gold palm fronds on the right and left panels point to The Enclave's list of amenities and apartment features, guiding prospective tenants to the most relevant information. 1 foil stamped area on Side 1 of uncoated 100lb Mahogany Linen stock. C1 business card slits on pocket. 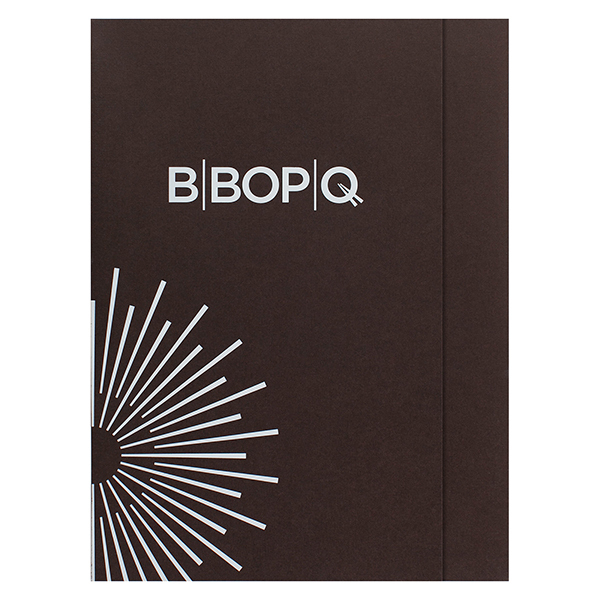 Up-and-coming restaurant B|Bop|Q and graphic firm Hoon Designs partnered to create this sophisticated design. Its rich mahogany stock and vertical right pocket radiate style and maturity. A geometric circle seems to be made of spokes, which are actually chopsticks patrons use at the Korean fusion eatery. The shape spans both covers, so its full size is only visible when the design opens. Four-color process printed on both sides of 130lb C2S Dull stock. Coated with Aqueous Matte. 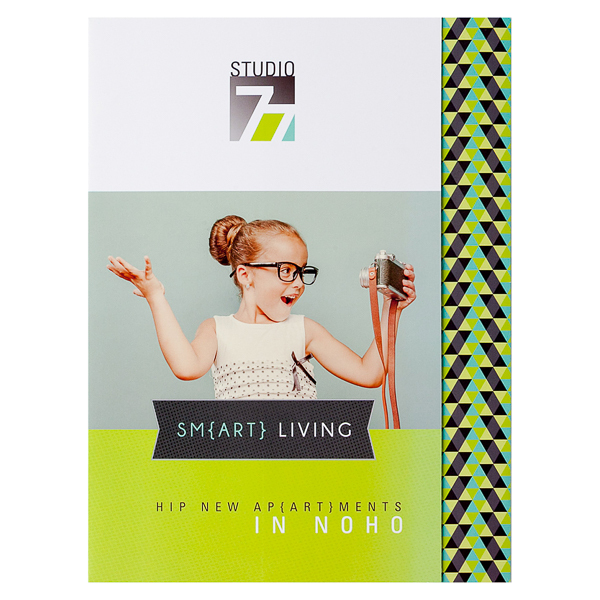 Studio 77's stylish design reflects its location in NoHo's art district. Its playful use of brackets emphasizes the word "art" hidden in other text. Wide text spacing balances the design's energy and gives it room to breathe. Vibrant colors and patterns spice up the panels, creating strategic white space. Photos adjacent to the bright colors depict the twenty-somethings who live at Studio 77; this labels the apartments as a youthful community. A single pocket extends a bit beyond the cover, so its optional tuck tab can latch to secure the 8 1/2" x 11" print media inside. Available in portrait or landscape orientation, the product creates a variety of design options. Landscape orientation lets the pocket cup the bottom of its contents, preventing any papers from slipping or falling out. Its wider canvas is perfect for large photos. The more popular portrait orientation offers a vertical right pocket, making its contents the first thing the viewer sees. The pocket's unusual layout creates a memorable viewing experience. Dimension Open: 16-1/2" x 12"